STIHL is promoting a line of outdoor power equipment in 2015, the STIHL Odyssey (2015, l’Odyssée de STIHL in France). The new 35 second film aims to demonstrate the force behind the brand’s all powerful blowers as our space hero takes an intergalactic ride all thanks to a STIHL blower. The film features the signature music from Stanley Kubrick’s “2001: A Space Odyssey”, ‘Thus Spoke Zarathusa’, composed by Richard Strauss. 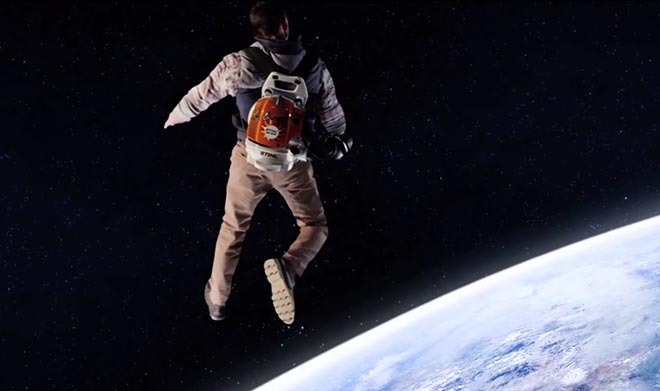 The Stihl Space Odyssey campaign was developed at Altmann + Pacreau by creative director Olivier Altmann with agency producer Edouard Pacreau and account director Thomas Vigneron working with Stihl marketing team Régis Guimont and Gilles Olleris. Filming was produced at Gang Films by producer Nathalie Le Caer.